Decorative painting is more than just ornamentation; it can also be a vital problem-solving tool for interior designers. As an Atlanta faux finish artist, I use a variety of decorative painting techniques, materials, and tools to help bring the design visions of some of Atlanta’s most talented interior designers to life. Read on to learn more about how decorative painting can transform a space! Decorative painting gives you the design possibilities (and more) of wallpaper without the problems. Wallpaper has seen a resurgence in popularity in recent years, and it’s easy to understand why. Rich finishes and striking patterns can add much-needed personality to a space; however, wallpaper does have some practical drawbacks. Adaptability- Even small irregularities in a home’s construction can cause major problems when it comes to applying patterned wallpaper, especially if walls aren’t perfectly plumb or floors have a slight slant. Curved walls, alcoves, unique ceilings, and other beautiful architectural features can also be problematic when it comes to wallpaper installation. 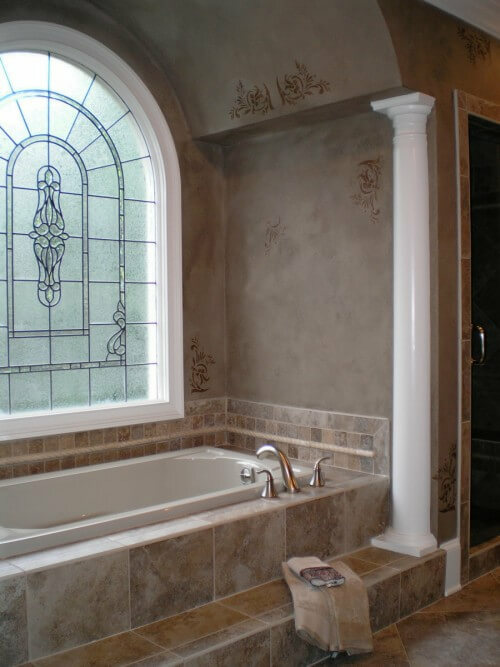 Decorative painting, on the other hand, can give you the same look while working with your home’s existing architecture to obscure those little quirks of construction that all homes have, or to place emphasis on your home’s best architectural features. 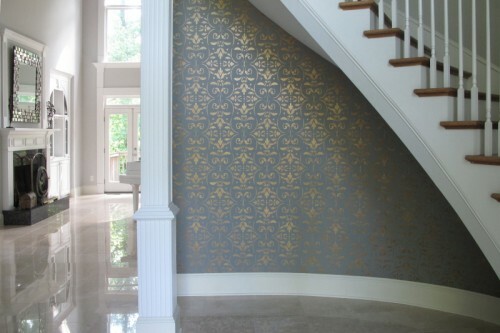 For instance, the gold pattern applied to the wall of this foyer shows how hand-stenciling a pattern can make uneven floors and walls look straight. Durability- Another advantage of decorative painting over wallpaper is longevity. Improperly applied wallpaper can result in a bubbling effect, and wallpaper seams do tend to show more as the wall treatment ages. Damage to the wallpaper usually can’t be fixed until the room is re-papered. Decorative painting is often the more durable option, and can be repaired more easily in case of scratches or scuffs. Creativity– Obviously practicality isn’t the only concern when it comes to interior design, and faux finishes beat wallpaper once again when it comes to creative possibilities. While your wallpaper choices are limited to what’s available on the market, decorative painting can give you any pattern you like in any scale and color, not to mention the possibilities for one-of-a-kind finishes that incorporate metal leaf or three-dimensional texture. In the dining room above, the stenciled pattern fades in and out for a one-of-a-kind look that can’t be matched by wallpaper. Ready to bring your most ambitious interior design ideas to life? Contact us today to discuss your decorative painting needs, and be sure to follow us on Facebook and Houzz for design inspiration and our latest projects!